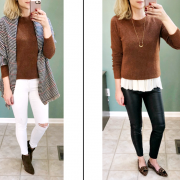 Since so many of you have commented recently about wanting to see how I put outfits together, today is the first in a new monthly series called Perfect Pairings. 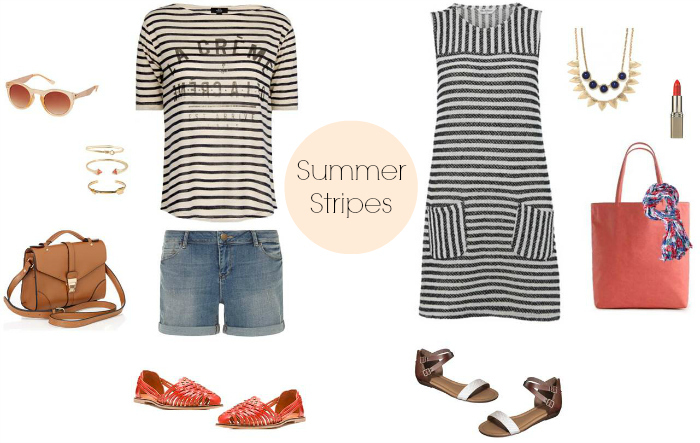 I’ll show you two affordable looks based around the same theme…and for June, I’ve chosen stripes! I especially gravitate towards striped pieces in the warmer months – what could be more summery than a classic breton shirt and a bold red lip? And because I found so many great budget-friendly options, I’ve included even more items that you can scroll through below for whatever your personal style may be! I totally agree! I always seem to gravitate towards stripes also for the summer months as well as the winter! Love outfit #1!!! Love the tee AND the dress! Great finds. Stripes are a serious addiction for me, so obviously I LOVE these outfits. So so cute. Fabulous post, love. I always love stripes, that shirt is adorable! Great pairing with a little coral. There's nothing better than stripes in the summer. Love both of these looks. I can see you in the dress for sure! I'm a sucker for stripes…these are great finds to create super cute summer looks! I agree – stripes make everything cuter! Great picks! Love both of those looks! I think I need that tee! yay for pairings; great idea. Love both of these looks so much, though number one would totally be my perfect weekend daytime look. those sandals are so great (real leather!). I've been obsessed with stripes for Spring/Summer! Loving the casual outfit. I love the style you picked out with the strips!! Perfect look for the summer!! LOVE both outfits…you can seriously never go wrong with basic stripes! I'm really getting into stripes as of late. Thanks for the inspiration! Basically I need all of these items. Please ship and bill my Husband. Thanks! The outfits both look awesome! I especially want the dress.